Kalinga Deshapriya is the second young Sri Lankan filmmaker who will shine at this week’s Cannes Film Festival marking the country’s cinematic identity at the world renowned festival. “I don’t consider this a great achievement but it is a recognition given to the collective work of art made out of genuine feelings,” says Kalinga Deshapriya who was elected to be featured as the second Sri Lanka filmmaker at the 66th Cannes Film Festival from May 15 to 26. Kalinga has flown to Cannes with his ‘Mehi Kaviyak Nomatha’ (There is no poetry here), 10 minute short film which will be screening under ‘Short Film Conner’ at one of the top film festivals in the world. In Cannes, Kalinga’s film will be screened along with another young Sri Lankan filmmaker Sanjeewa Pushpakumara’s ‘Unforgiven’, a story based in South Korea. Written, cinematographed and directed by Kalinga, ‘Mehi Kaviyak Nomatha’ is a story of personal experiences of post-war Sri Lanka. “This film ‘Mehi Kaviyak Nomatha’ is an outcome of a group of like-minded friends who were concerned about the contemporary social, political and ethnic development. “We have been brought up with a war and all our lives we have seen war. Now the war is over but do we really feel it,” questions Kalinga describing question that the group of friends were asking each other. “We thought that rather than waiting for answers we should do something and in this film,” he said on the birth of the film. Born in Galle and bred in Mihinthale, Anuradhapura, Kalinga who loves arts and painting, a talent inherited from his teacher mother got attracted to cinema with a series of films that were shot in his village. “H. D. Premaratne’s ‘Visidela’, Prasanna Vithanage’s ‘Pura Handa Kaluwara’ and ‘Asoka Handagama’s ‘Mey Mage Sandai’ (This is my Moon) were mostly filmed in Mihintale, my village and as a school going student I used to spend hours at the locations,” Kalinga said describing his early experience which motivated him to take to the cinema. In 1998, still a school boy Kalinga met experienced art director Rohan Samaradivakara and through him got the opportunity to work in Asoka Handagama’s television drama “Synthetic Sihina,”, the stepping stone to cinema. Following this Kalinga joined Handagama’s “Me Mage Sandai” and thereafter almost all his cinematic productions. A born painter, Kalinga’s forte in cinema was cinematography and soon he formed an alliance with the internationally acclaimed Sri Lankan cinematographer Channa Deshapriya who became his mentor. Started with ‘Me Mage Sandai (This is my moon)”, Kalinga’s journey as the assistant of Channa continued to ‘Aswesuma’ (2001), ‘Sulan Kirilli’ (2002), ‘Flying with one wing’ (2002), ‘Empty for love’ (2003), ‘Sulanga Enu Pinisa’ (2005) and ‘Aksharaya’ (2005). Along with these feature films, Kalinga was constantly occupied in various documentaries and short films. Selected for his portfolio as a cinematographer, Kalinga’s international break came in 2005, when he became one of the two young film artistes to participate in one month’s workshop organized by the Asian Film Academy in South Korea. For his outstanding cinematographic performances at the workshop, Kalinga receives the KAFA Asian Scholarship to follow his higher studies on the art of cinematography at the Korean Academy of Film Art, Korean Film Council for three years. Very soon Kalinga’s name as a cinematographer became popular not only locally but internationally. Benette Ratnayake’s ‘Ira Handa Yata’ was the first feature film that Kalinga filmed. Cannes awarded filmmaker Vimukthi Jayasundara’s ‘Light in the yellow breathing space’ and ‘I too have a name’ directed by Suba Siwakumaran are some of the newest films Kalinga worked for. “Cinema is a very serious vocation. You need a dedicated team. I don’t know whether I am ready to take such a responsibility again,” says Kalinga talking to TV Times a few days prior to his flight. The film ‘Mehi Kaviyak Nomatha’ is result of continual discussion by a group of like-minded youths who wanted to show the contemporary problems specially in post-war Sri Lanka. “The biggest tragedy in our cinema is we don’t have motivation or stimulus to get into cinema. In Korea I saw how the children in the Montessori were exposed to the visual media so that they would start liking in it,” Kalinga said. “Even though Dr. Lester James Peiris had gone to Cannes, until Vimukthi Jayasundara made it no young filmmaker believes that we can make it,” the determined young filmmaker said. While the young filmmakers with their endurance reach international heights, it’s a tragedy that the existing bureaucratic system had failed to do much for them or the cinema. “To learn about cinema and its development we have to watch all kinds of cinema. Banning or blocking South Indian cinema or in that case any cinema is a detrimental move,” the young filmmaker said protesting against the demand by certain extremist groups to block South Indian cinema entering the cinema. 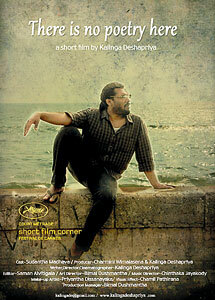 Asked what his future role between director and cinematographer, Kalinga said, “I am still undecided. To be a director on has to be genuine to his feelings and work on what I believe in. But I am not sure in the present social context whether it is practical. But as cinematographer, I will have to carry out what the director tells and what the director wants,” Kalinga said.